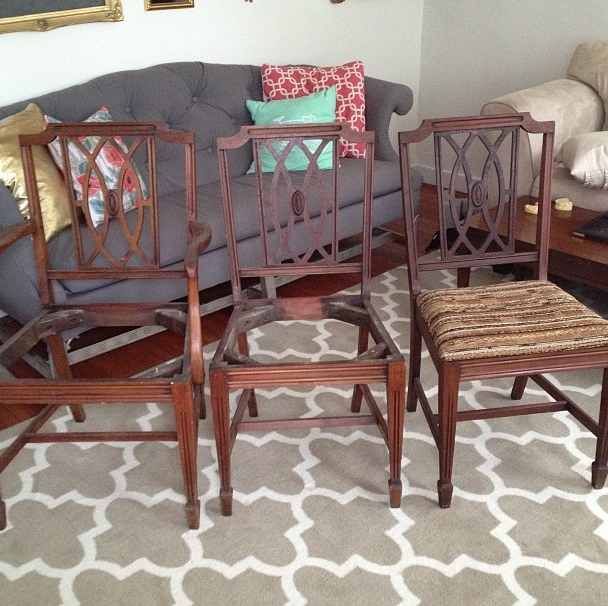 Almost a year ago, I found these amazing chairs on the side of the road. What!!?? I know. Someone couldn’t see past the yucky fabric and lack of seat cushion on the other two. Okay, I’ll give them that but seriously, these chairs are amazing and have incredible potential. I was immediately drawn to the detail on the back. The one in the center had a little more damage than I wanted to deal with so it ended up back on the curb but the one on the right and the one on the left were money! When Savannah and I competed in Creating with the Stars, I was in charge of the “paint” round and created the infamous Painterly Pixelated Wall that won us 1st place that round! 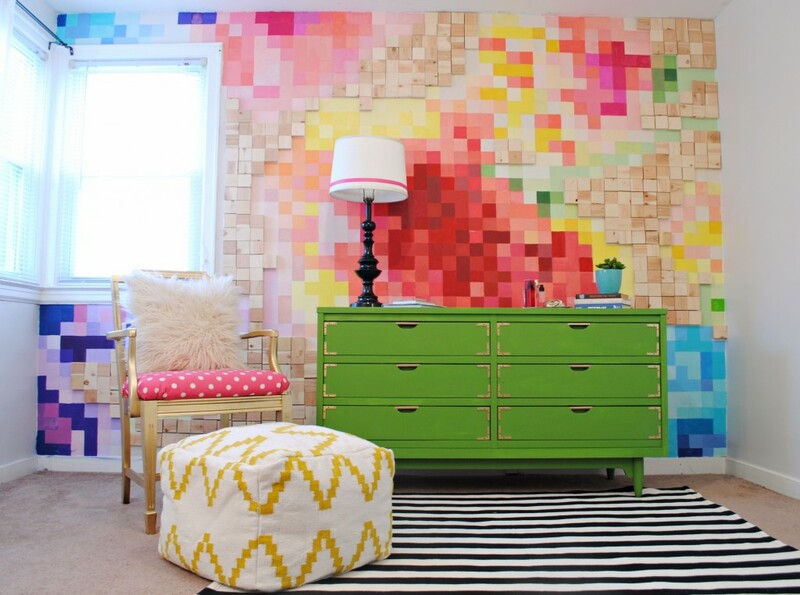 When I thought about staging the wall, I wanted some bright fun furniture and funky accessories. 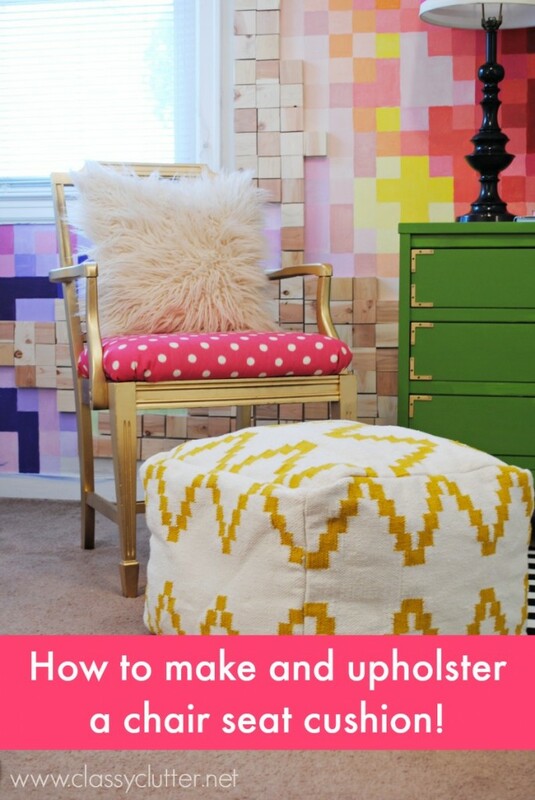 My wheels started turning and I remembered this awesome (lonely in the basement) arm chair that needed a fun makeover so I’m going to teach you how to upholster a chair cushion! I immediately got it outside (at 11pm mind you) and spray painted it gold. Next, if you remember, there’s no seat! Whoopsies! I went to my wood stash and I had this piece that was almost a perfect fit. Once I got it screwed in, it was nice and sturdy so I didn’t mind that it wasn’t the exact shape of the chair’s frame. Next, I had this left over piece of foam so I cut it to size. Have you ever tried to cut this stuff??? You’re supposed to use an electric carving knife, Thanksgiving style, but I don’t have one so it was a good ole serrated knife and some major sawing for me. Pardon the scraggly edges.Don’t worry, know one will ever know. Next up, batting. 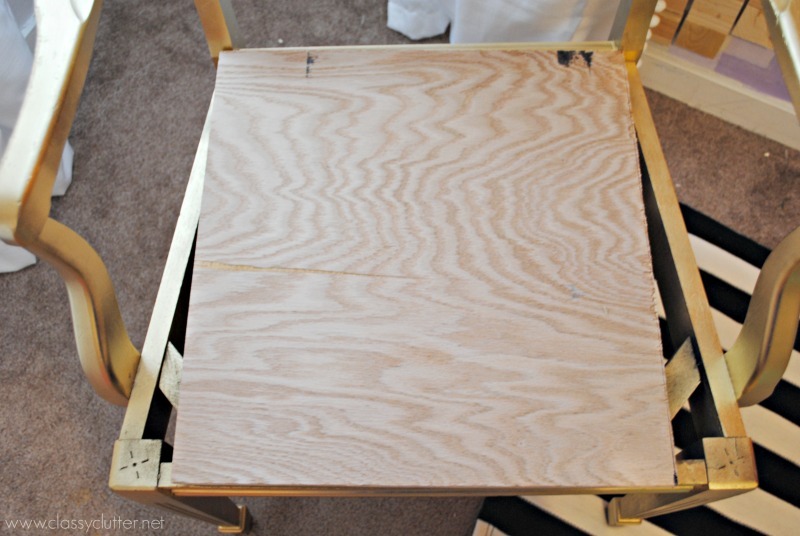 You’ll need to cover your wood base and foam with batting. 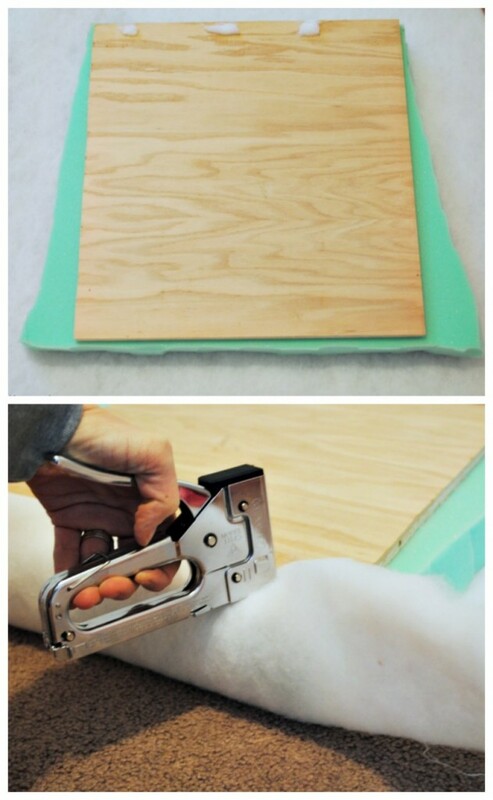 You only need enough to cover your square and wrap around the foam. Staple that batting on and check to make sure if fits on your chair frame. It should fit snuggly after being all wrapped up in foam and batting. Next, repeat the batting step with your fabric. 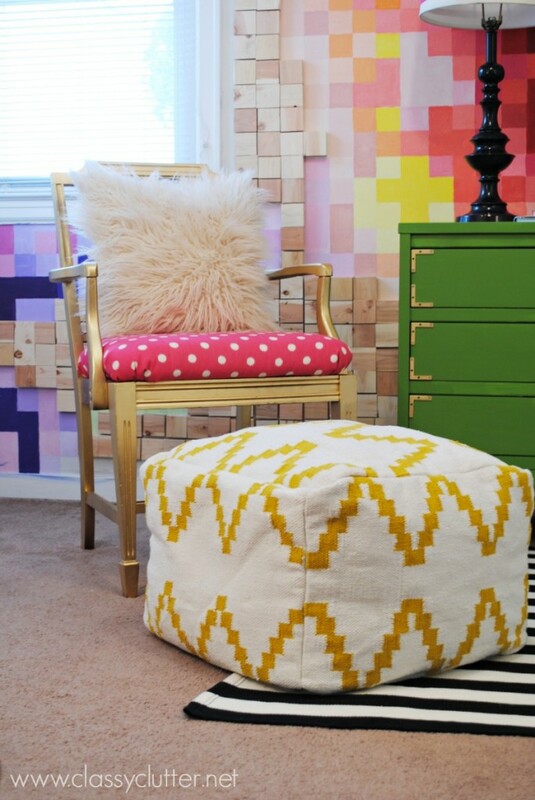 I got the cute ikat polka dot in pink and white from Hobby Lobby and I think it is absolutely perfect! 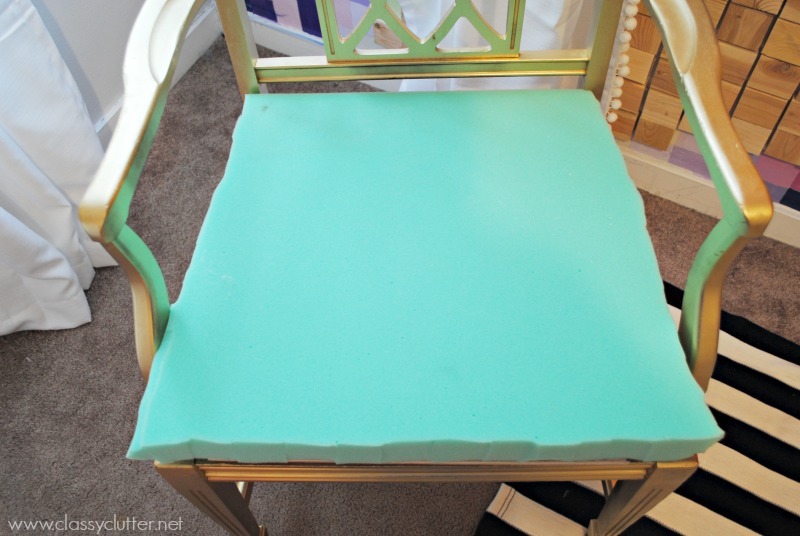 Next, attach the new upholstered cushion using some long screws and tada! Done! Now, don’t be afraid to pick up roadside, yard sale, or thrift store finds that need a little TLC! Totally worth it, right!? Love the tutorial, great find on the chairs. Quick question, which gold spray paint is that? 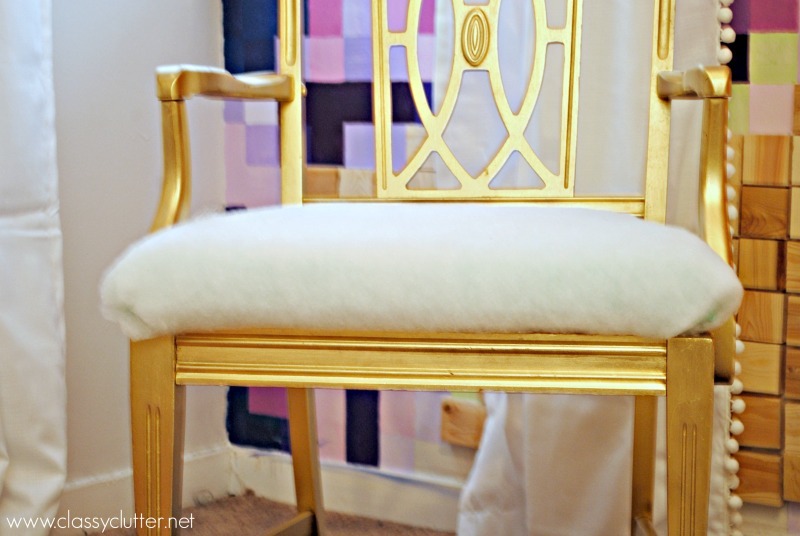 Each brand is a slightly different color and I love the bright goldenness of your chairs!